Hello and welcome to our brand-new web site. Please take some time and explore it. We hope you’ll be as pleased with it as we are. If you see or think of something that you believe might be a useful addition to the site please pass your suggestions to me, Fr. Robert or email them to our Webmaster, Martyn at martyn.perring@stpeters-bocking.net. 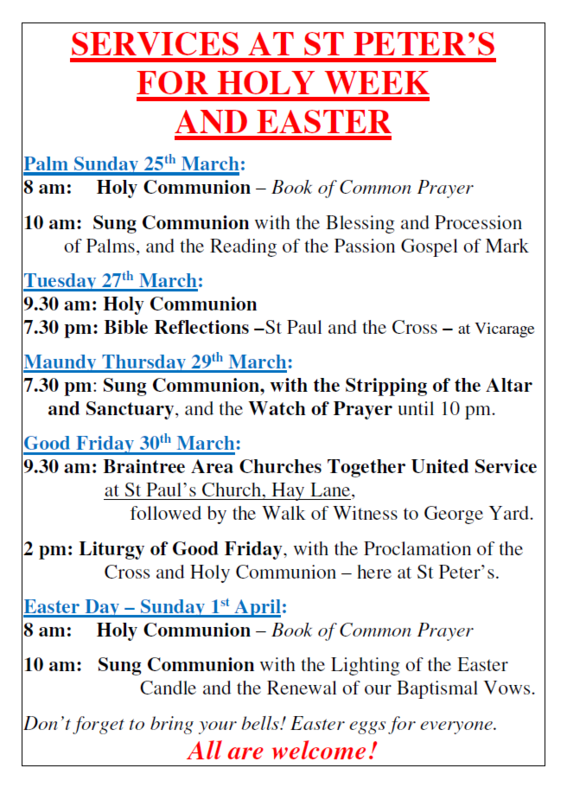 To get us started using the new facilities that come with our new web pages please see below for details of St. Peter’s Holy Week and Easter Services. We hope you enjoy our new-look web site and look forward to seeing you during Holy Week and Easter. Copyright © 2018 - 2019 The Parish Church of St. Peter's in the Fields, Bocking.